Illegal sand mining, ecological degradation, and the mining mafia in Himachal Pradesh. Sand mining conflicts are very visible in India. 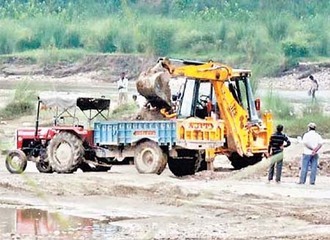 Over the past few years, the Chakki riverbed in the North Indian state of Himachal Pradesh has been suffering from illegal sand mining operations. Massive quantities of sand are mined from the Chakki riverbed, and transported to other regions of the country for real estate development and other construction related activities. Sand mining has serious implications for the sensitive local ecology of the Himalayan state which has large sections of its population dependent upon access to natural water and agriculture. Impacts of this illegal sand mining includes massive economic losses to the state exchequer. Sand mining has also resulted in negative impacts on the local environment, pedestrian paths, pastoral lands, and water supply schemes. The sand mining operations pose a dire threat to the local ecology, and likely to have negative consequences on hundreds of acres of fertile agricultural land surrounding the riverbed. According to available figures, close to 26000 acres of land in the neighboring villages have been rendered barren owing to sand mining in the region (Atri, Divya Himachal, 2014). Outside of the impacts on agricultural lands, sand mining has resulted in the reduction of the Chakki riverbed, which originally was over 1 km wide, to a 10 meter wide nallah (Atril, Divya Himachal, 2014). Mining of large boulders in the region has also resulted in the destruction of various hillocks. The villages which suffer the most from mining of boulders are Bangarh, Chatara, and Jakhera (Kanwar, Divya Himachal, 2014). According to local people, and photographic evidence, entire hillocks in these regions have been levelled. Boulders are usually extracted by digging up 20- 30 foot deep into hillocks using machines (Kanwar, Divya Himachal, 2014). In this region, severe impacts have been felt along the Swan River. As a result of mining of these boulders, which are further crushed using large crushers, various nallahs and river in the area have completely dried up. In recognition of the ecological impacts, and loss to state exchequer due to illegal mining operations, the National Green Tribunal, in August 2013 ordered a blanket ban on any mining activities in the region without prior environmental clearances (Jiten, 2013;Mahajan, 2014). The NGT order banned sand mining operations in the region unless appropriate environmental clearances are obtained by miners. However, local agents, villagers, as well as local officials claim that despite the mining ban, illegal mining continues unabated in the region bordering Haryana and Punjab (The Tribune, 2014). This can be evidenced by thousands of vehicles continuing to carry extracted minerals to adjoining states. It has been observed that overloading of trucks is a common sight in the region. According to estimates, trucks with 9 tons carrying capacity permits, overload and carry close to 25 tons (Divya Himachal, 2014). In Nalagarh, nearly 2800 tractors are notified for commercial use to carry material like sand and gravel. The tractors used for transporting illegal materials are often registered only for agricultural activity. However their registration as ‘commercial vehicles’ is an acknowledgement and approval for illegal use by local government authorities (Sharma, Divya Himachal, 2014). Additionally there are irregularities with respect to the subscribed standards of mining. For instance, as per orders, mining of the river bed is required to be monitored once it increases beyond the depth of one meter. However, JCBs and stone crushers have dug more than six meter ditches in the whole area causing a threat to adjoining cultivable land and ecology (The Tribune, 2014). As a result local villagers have been protesting the illegal mining operations by communicating with local authorities. However, pleas have gone unheard by local authorities and have left them in a desperate situation. One of the most active organizations in the region is the Bharatiya Kisan Sangh (Mahajan, 2014). Bharatiya Kisan Sangh is a local unit which has been leading the movement against illegal sand mining, and has been active in bringing the issue to the light of local authorities. Under this banner, villagers from the upper Khanni region submitted a memorandum to the state government in 2014. The complaints included loss of agricultural productivity of surrounding lands, and impacts on the local water supply channels due to reduction of the local groundwater levels. Villagers also submitted pictures showing damage to their agricultural lands. In the villages of Talwars Jattan, Kandran and Mirthal villagers have been complaining regarding the disturbance in their sleep owing to high decibel noise generated by heavy digging machines operating illegally in the region (Dhaliwal, 2014). However, villagers claim that their complaints to officials in the region have not resulted in any action. An official in the region stated: “is this unabated plunder of the river bed does not stop, a time will come when its level with go down. This is a sure recipe for ecological disaster. Criminals are carrying out their activities in the absence of clearances from the Ministry of Environment” (Dhaliwal, 2014). The illegal operations have also resulted in the creation of a strong sand mining mafia in Himachal Pradesh, and the neighboring states of Haryana and Punjab. The amount of profits earned, and the presence of mining mafia has resulted in various attacks on government officials like the SDM, and the police officers which were checking this illicit activity in the recent past. In light of this, in 2014, the former MLA Rakesh Pathania demanded a Central Bureau of Investigation (CBI) inquiry into the illegal operations, the presence of mining mafia, and the collusion of local police and government actors (Mahajan, 2014). In 2014, 25 people from a Hyderabad college who went into the river bed through an approach road built for illegal sand mining, were swept away following a sudden release of water from the Lahri hydro-power project. Following this, the Industries Minister directed the closure of all link roads used for illegal operations and to ban the dumping of any debris within limits of the hydro project area. Immediately after the drowning incident, all illegal approaches were ordered to be shut down (News18, 2014). However, illegal mining operations still continue in the region. An anyonmous official disclosed that “the Mirthal belt has nearly 70 crushers and is a major contribution of sand and gravel to other parts of the country. The chakki river flows through this belt and remains a lucrative business for criminals” (Dhaliwal, 2014). Project Details Large scale illegal sand mining. According to press reports  (R. Dhaliwal, in The Tribune, 21 June 2016) :"some of the quarries here have been auctioned by the state government. However, the contractors who had won the bids claim that raw material was not being procured by stone crushers from them. The say: "we have won the bids. However, we are running into losses as crushers are purchasing material not from us but from illegal sources." Stone crusher owners have formed cartels which in turn engage in illegal digging of sand and gravel. In this way, instead of taking material from legal contractors, they take it directly from their own people indulging in under-cutting of prices. The Mirthal belt, which has nearly 70 crushers, is a major contributor of sand and gravel to the other parts of the country and Chakki river which flows through this belt, remains a lucrative business for criminals,” disclosed an official." Why? Explain briefly. Despite of the National Green Tribunal ban, which could have potentially resulted successful of the environmental justice movement, illegal mining continues in the region. Jitesh. 2013 (8th August). NGT banned sand mining across India without license and environmental approval. Jagran Josh. (Last accessed: 1st February, 2017). Divya Himachal. 2014 (6th December). Mining mafia targets border districts of Himachal. Divya Himachal. (Last accessed: 1st February, 2017). Mahajan, R. 2014 (21st September). Check illegal mining on Chakki riverbed: Villagers. The Tribune. (Last accessed: 1st February, 2017). News18. 2014 (15th June). 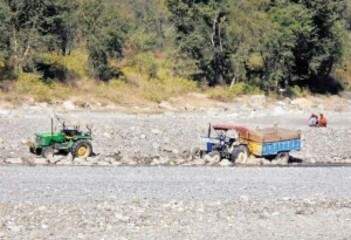 Himachal Pradesh: Beas tragedy exposed illegal sand mining. News18. (Last accessed: 1st February, 2017). The Tribune. 2013 (26th December). Protest against illegal mining in Chakki. The Tribune. (Last accessed: 1st February, 2017). Dhaliwal, R. 2016 (21st June). Pathankot admn seeks report on ‘illegal mining’ at Chakki riverbed. The Tribune. (Last accessed: 1st February, 2017). On the Beas river tragedy. Inside India's Deadly Sand Mafia.